Indian Railway Catering and Tourism Corporation - IRCTC is attracting its users with rewards and additional cash benefits. IRCTC is now offering cash prize of up to Rs 10,000 on linking Aadhaar card number with registered IRCTC user ID. IRCTC account is valid until June 1, 2018. IRCTC users, who have authenticated themselves with Aadhaar KYC (Know Your Customer), are eligible for the ‘Lucky Draw Scheme’ by the Indian Railways. The offer is also for passengers booking their tickets on irctc.co.in using BHIM/UPI. IRCTC will select five users travelling during the offer period through a computerised lucky draw process under this Lucky Draw Scheme. 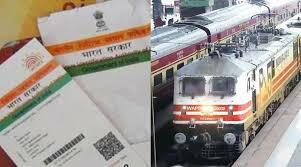 Users who linked their Aadhaar card with IRCTC account will be selected and their profile name should also match with one of the passengers’ names on the booked PNR. Winners will receive Rs 10,000 cash prize and a refund of the full train fare upon verification of basic details by IRCTC. Employees of IRCTC and CRIS ( Centre for Railway Information Systems) cannot avail the befits of the offer.In case more than one PNR of the same user gets selected during the draw, only one of them will be considered eligible for the scheme. The names of the winners will be displayed on IRCTC website in the first week of the following month after Indian Railways has completed the verification process. The winners will also receive an alert message on their registered e-mail ID and phone numbers. Please correct your TITLE. It should be Rs.10,000 for 5 person through raffle draw. Now it seems like a trap.